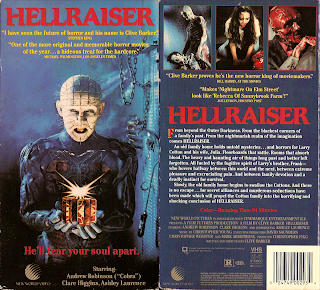 Perhaps more so than the Evil Dead series, if there's one modern horror classic spotted seemingly everywhere on tape in my travels, it would have to be Clive Barker's Hellraiser. Thanks to the early forms of Anchor Bay Entertainment, I've even once discovered a cassette squirreled away in a box at a church sale. Given their availability and cheap price, the gold-lined EP-speed tapes released by "Starmaker" were apparently dropped via Hercules transport by the tens of thousands across the country. Anchor Bay's later cheapie and double feature set with Hellbound sold like hot magnetic cakes as well. 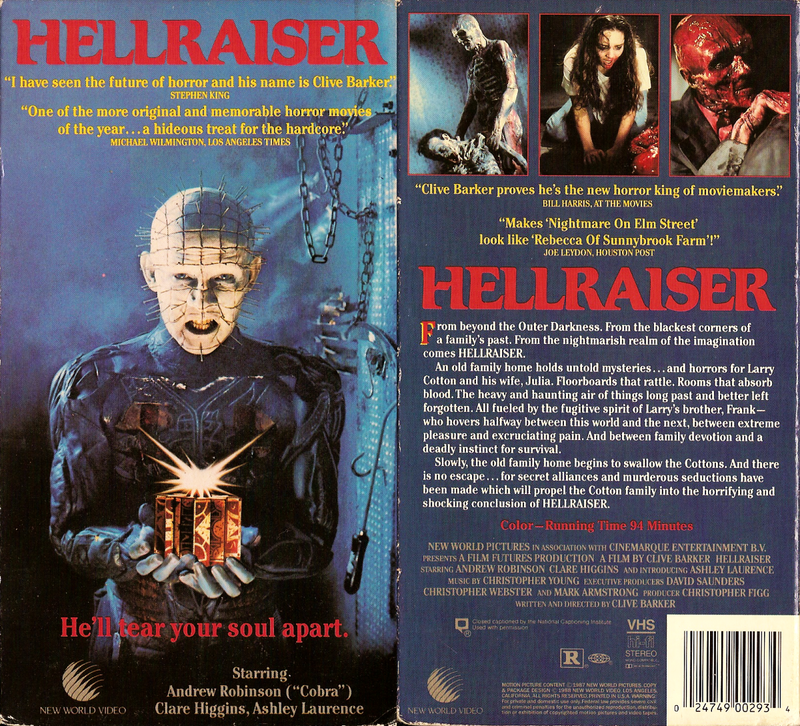 This is more a blessing than curse, as I don't believe Hellraiser would possess anywhere near the widespread prominence that it holds today with both horror and general movie fans alike without such dissemination. The tiny downside being New World's original VHS falling into a soft obscurity in the wake of piles of re-releases. Much like the mostly forgotten debut Wizard Video Texas Chain Saw Massacre, Thorn EMI Evil Dead, and even New World's Hellbound. Aside from being the first home video of Barker's ingenious tale, there's nothing special about this edition. While the releases afterward arrived unrated, the version presented here is the MPAA's R-rated version. Many resources indicate that only Julia's first hammer killing for Frank was trimmed. Upon watching it over the weekend; Frank's initial death, the last john being "drained" by Frank's hand tearing into his neck, the rat killings, and several hook shots ripping into Frank at the climax are also missing/trimmed. The brutal quick shot of the giant hook digging up Frank's spine is strangely intact. Despite being truncated, this version shows the hypocrisy of the rating board, their unevenness with judging a film's content, and preoccupation with the "tone" of graphic violence. The resulting Hellraiser is still profoundly disturbing both visually and contextually. It's amazing how the MPAA wasn't vastly harsher on this film considering their strictness forced upon masked killers slashing up horny teens just a few years earlier. Perhaps most disturbing of all. I've never seen that before, kinda nuts that it looks to preempt the end credits!